We are all born under different roofs, from different parents, and in different times, and each one of us has a different diamond shining within; therefore, we are different. What seems easy to some, may be difficult to others , and obstacles can be seen as opportunities in someone else’s eyes, thus, it is certain that we will not reach the finish line similarly. He might fly his way there, she might get there with golden medals, you might get there after everyone has already finished, and I might get there, all bruised and fed up. But one thing is certain: we will reach the finish line. How we get there however only depends on whether we choose to accept defeat or rise above all pain and fight our way to the top. Being admitted to one of the most important universities in Lebanon, The Saint Joseph University, on September 2014, was a joyful event for both my family and I, although AUB was my main goal, but I gratefully took what was given to me. I expected to easily succeed, not knowing I had such strong and ferocious competitors. Once it hit me that there are smarter people, I lost all self-confidence and sunk in that stupid phase of depression that drowned me deeper. I did not know what it was I should do to get back up, but the more they rose, the more it was difficult for me to move forward. I was, at that time, evaluating them and not myself. Failure stroke, and by the end of my fourth year, I was holding more than 6 courses, or were they holding me back? I had failed 9 courses out of 12. I was not disappointed though, because I knew what the issue was, I knew whose fault it was… Mine! I was responsible for my failure, because I was trying to be a bird in the water, or a fish in a tree. I tried running as fast as my colleagues did, I tried to be as good as they are, and only when I failed to succeed, did I realize that I was trying so hard to run someone else’s race. Only when I realized that, did I choose to walk my own footsteps, and only when I walked my own footsteps, did I learn to embrace myself and accept my pace. Long story short, if you are, as Einstein once said, judged as a fish by the ability to climb a tree, you will live your whole life believing you are stupid. So never doubt your capacities and do not compare yourself to others because if they can fly and you can’t yet, you might hurt your fragile wings, trying too hard. 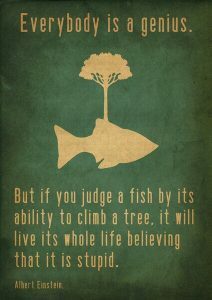 Don’t be the fish in a tree I was. Embrace your pace, love your brains, adore your talent no matter how small or simple it may be. Time will be your best friend and patience your mentor. And you! You will become your own idol, as unique as your own star… because we are all but born under different stars. A very well written article to which I somehow relate. I had the same battle when I first started university, for it was a hard transitional phase. Gladly, I was able to adapt in a short time. However, there’s nothing wrong with embracing our own pace and taking our time as long as at the end we’ll reach our goal. Thank you for opening up and sharing this personal experience in such a positive way. Thank you Diana. I am pleased to hear that you were able to overcome such a phase. And yes. No rules were set for us to accomplish things in little time, for life is ahead of us, and we should live day by day and step by step.